The Nook was the first eReader we owned. And despite it being generations old at this point, we still use the heck out of it. I'm happy to say that I've finally worked through some back end challenges and now Numbers 16:32 and all future content will now be available on Nook. Hit up the Popples. Grab a Pound Puppy for my sister if I see one. Don't grab a bike it will slow you down. Clear out the action figures just like you did the video games. Save all remaining time on Transformers. Skip the Go-bots. Please pardon the inaccuracy in the image depicted on the cover of an upcoming story I'm publishing that starts with a fresh copy of the Sears Wish Book. I mashed up two covers into something fresh. Perhaps a catalog from a parallel universe. String theory and commerce! There's nothing terribly ironic of LOL about this video I just thought it was interesting to that there was once an infomercial for a store catalog. In finishing the newest short story for June's release, I've hit quite a wall. I know how things begin and the middle, but rarely know the endings until about a week or two before my self imposed deadline. It's only now that I've noticed it's a pattern. In writing the two novel drafts, and in "Numbers" and "Popular Mechanics" I've had the same problem. The answer been usually the same I'll throw my hands up give what I have done so far to my wife. She cuts through the story with sharp eye and that's they catalyst that somehow triggers the appropriate ending. After that it's a quick ride through the rest of the rollercoaster. "Popular Mechanics" now has an ending that feels appropriate and I can't wait to hear what readers think about it. It's a great progression from Numbers and I'm looking forward to posting it to the eShop of your choice. I'm off to the artist to see if what he thinks of my rough concept for the cover. Something that really captures the peak of high technology in the 80's. I squarely in the hobbyist camp of writing. I keep it limited to the train and here and there in the late evenings. In starting to share my work through sites like Noisetrade, it's been amazing to hear from people reading Numbers 16:32 from all over the world. In honor of an especially huge day of new countries on my list of readers, it's time for Animaniacs! I'm working on three stories for release in the three months ahead. Like Numbers, I'm rolling out each one on Noisetrade free for a month before retiring each one to Amazon and the other standard digital shops. Popular Mechanics for the Domestic Set: Valerie adjusts to the dating scene with the help of the latest technology 1982 has to offer. The Curious Thing About Molecules: An entirely new kind of apocalypse for people tired of reading about the nuclear, viral and climate change kinds. The Royal Ladybugs of Maryville: A woman's social club tracks down the criminals the local cops don't dare touch. I'm genre hopping this summer while plotting out the next proper horror offering in the vein of Numbers. There's also the promise of the children's book being published in physical form at some point on the horizon as well. Thanks for taking this ride with me. As a bonus here's the most 90's thing I've seen in a while. TMNT on Oprah. Thanks to each of you for downloading, reading and sharing your feedback on my first short story on Noisetrade. I've done no marketing up to this point, so It's amazing to hear from people all over the world who have discovered the book purely by clicking around. As an avid user of the site, I'd placed the book on Noisetrade as a great way to get the it to my friends and family at no cost. I have discovered a really engaging community of adventurous readers looking to try new authors. I will be transitioning Numbers 16:32 to Amazon, Kobo, Google Books, iBooks etc. on May 30th, so if you know anyone that may be interested in reading it while it's free, now is the time to tell them. I will be posting a new novelette of a very different genre on Noisetrade at that point. Like Numbers it's a bit of a mash-up involving getting back on the dating scene, high technology, and the the 1982 Christmas Wishbook. Spoiler: It is not a magic catalog actually granting wishes. There's no nasty green moss in this one either. Again, thanks for reading and letting me know what you think about Joseph and his discovery down the well. 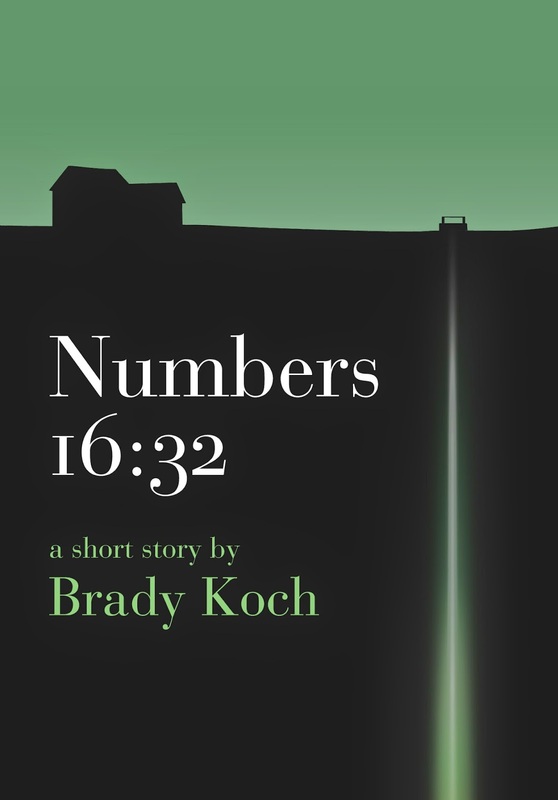 Until next time, here a fun review of Numbers from I Heart Reading. In our house Kyle Mooney is the bright spot in the new season of Saturday Night Live. In honor of his work in Wing and Chris for President, I also want to share one of our favorite clips of his from Norm McDonald. Die? Level grind until you can kill the boss. Kill the boss then backtrack across screens and screens of maps to your next flag destination. Equip new swords once you get enough points to forge them. That's literally it. The graphics are amazing though and I think that's why I'm still compelled to play through to the end. I'm certain the last boss is going to be an multi-screen stunner. Until then it's a real grind to get to the end of both journeys. I'm really happy with the new cover designed by @1ndika. I'm into minimalism for covers and was aiming for something akin to my favorite Signet horror covers from the early 80s. The Noisetrade free download will continue through May until it's replaced by the next novelette. It's about domestic life and high technology. I always have a title last so, more on that soon.